Frances, forced into marriag,e lived forty years as wife, mother and house-keeper before she was able to realise her dream of being a nun and ascetic. St Frances of Rome, Religious. Frances was born in Rome in 1384; died there on this day in 1440. 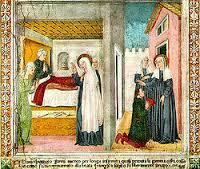 Established a community of laywomen who followed the Rule of Saint Benedict and ministered to the poor. Frances was a dedicated laywoman who, in a time of plague and civil war, worked tirelessly for the poor and the sick yet without compromising her love for her husband and family. This image is of a fresco in the Church of Santa Francesca Romana and shows the saint healing a girl who suffered from paralysis. At the age of eleven Frances dreamed of entering a convent to live a life of prayer and asceticism, but forced to marry, she lived forty years as wife, mother and house-keeper before she was able to realise her dream. Patrick Duffy explains. Frances (Francesca) Busso was born into an aristocratic family in Trastevere, Rome, in 1384. Her mother was quiet-mannered and religious, her father was vigorous and strong-willed. At eleven Frances wanted to become a nun, but her father arranged a marriage for her with aristocrat Lorenzo dei Ponziani. This caused Frances great pain, but she came to have a loving relationship with Lorenzo. They lived in the same palazzo as her parents-in-law. Frances’s mother-in-law Cecilia was totally taken up with organising parties and banquets. Frances, on the other hand, was more attracted to prayer and fasting. However, she found a companion and ally in her sister-in-law Vanozza who lived with her husband in the same palazzo: Vanozza had also wanted to be a nun. Both women found a way to be cheerful amid their obligations to the family, and also to find time together for devout practices and works of charity. Frances had two boys Battista and Evangelista and a daughter Agnes. When Cecilia, her mother-in-law, died, it was Frances who became the mistress of the household, a job she accomplished with skill and fairness. Generous-hearted, she would give away corn and wine to the poor during the famine and though the granary and wine cellar often became empty, they were just as often miraculously replenished, to the dismay of her father-in-law and her husband. When Ladislaus of Naples invaded Rome and took off John XXIII (then one of three antipopes of that time) as a prisoner, Lorenzo, who was commander of the papal troops, was seriously wounded and their son Battista was taken hostage to Naples. The plague then struck Rome and Evangelista died. Frances turned their palazzo into a hospital and shelter for the homeless. One year after his death Evangelista came to his mother in a vision and told her that Agnes was going to die too. 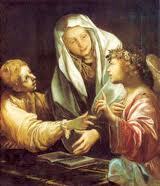 In return God was sending a special angel to be her guardian, companion and spiritual adviser. After the war Lorenzo and Battista returned home. Lorenzo was broken in mind and body. Much of Frances’s time and attention was given to nursing him back to his old self. By now Battista had grown into a charming young man. He married a pretty young woman named Mabilia. Frances expected Mabilia would share in the management of the household. But Mabilia only wanted to party. She would ridicule Frances in public for her shabby green dress, her habits, and her standards. But one day in the middle of yelling at her, Mabilia suddenly turned pale and fainted, crying, “Oh my pride, my dreadful pride.” Frances had to nurse her also back to health and the differences between them were healed as well. A converted Mabilia did her best to imitate Frances after that. Frances nursed Lorenzo until he died. His last words to her were: “I feel as if my whole life has been one beautiful dream of purest happiness. God has given me so much in your love.” After his death, Frances moved into the house with the other Oblates and was their superior for the four remaining years of her life. She now had the life she dreamed of when she was eleven. But God had had other things for her to do in between. Frances’s last words were: “The angel has finished his task – he beckons me to follow him”. When Frances died, she was buried in the Church of Santa Maria Nuova (now called Santa Francesca Romana, near the Roman Forum), where her relics still rest. She was canonised by Pope Paul V in 1608. Possibly it was because she had such continuous contact with her guardian angel that Pius XI named her the patron saint of motorists.